The Walking Dead is back on form after last week’s somewhat disappointing episode… well mostly. There was a lot that worked well here; the decision to make the slowest episode so far of this season be centered on two fan favourite characters was a wise one. As was locating the episode in Atlanta again. It’s been a long long time since the show explored the streets of a city landscape, and its a very welcome breath of fresh air as every shot instantly reminds us of how desolate and empty this world now is in a way which the countryside can never achieve. The slow nature of the episode works well as it provides a breather for the series (although it would have been more effective an episode or two back) and allows two of the best drawn characters to be introspective and talk about just where they are at. Most of this talking is done well enough, and I even liked the imagery of fire burning away different versions of Carol and Daryl over the years. As heavy handed as the show can be at times, I thought it worked well here. The episode’s biggest problem is that we knew almost every step that it would take. We knew from previous episodes that both characters were going to make it through the episode alive, that they would not encounter Beth yet and that in all probability they would meet up with Noah at some point. The only question that we really faced was whether Carol was going to get injured or not, and if she wasn’t faking her injuries then we wanted to know how she ended up at the hospital. It’s an interesting and somewhat gripping question, but the episode largely played out as we expected it to. It could have shaken things up by perhaps having Carol get hit by the car earlier on, and/or by increasing the tension and trust issues between Daryl and Noah. I’d be interested to hear what you guys thought of the use of flashbacks in this episode. I was a little torn as I understand that they helped demonstrate Carol’s background and fears, but did we really need to be reminded of all of that? I know that I have most certainly not forgotten what transpired between Carol, Tyreese and the girls…. Also, I really don’t think we needed to see what Carol got up to whilst away from the group considering that it boils down to plenty o’ nothin. This week’s opening has to be one of the strangest ones as absoloutley nothing happens; we learn nothing and don’t really see anything either. 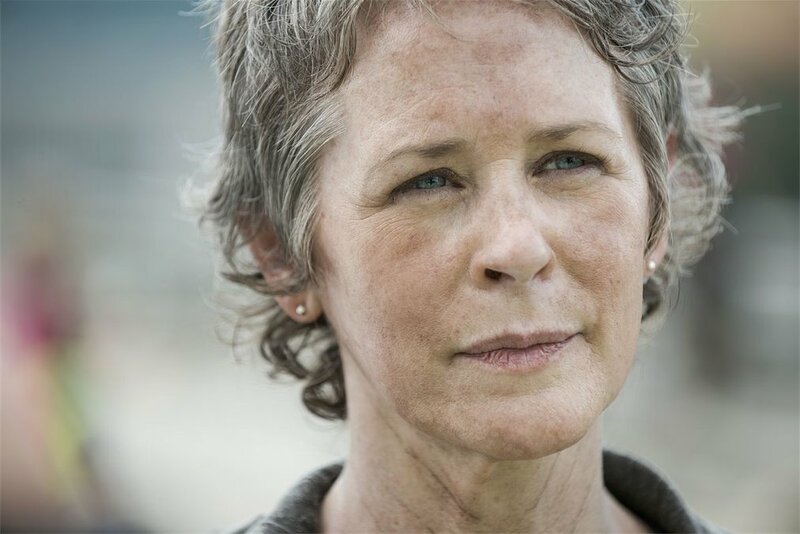 All the attention towards our favourite one woman army does suggest that perhaps Carol is on her way out but… I’m going to call it that this is a bit of a diversion and we are going to see another character die instead. Perhaps it will be Beth, it’s unlikely to be Daryl. I suppose considering that it looks like most of the gang are going to descend on the hospital it could well be anybody who dies as a result of the upcoming fight. So, ultimately this week was really a puzzle filler. Piecing together the last few episodes could have been extremely mundane, but luckily putting it in the hands of favourite characters and a new setting, coupled with strong acting and smart direction made it one of the better episodes this season. I haven’t mentioned the falling van moment… mainly because it was ridiculous and I would rather forget it happened. Let’s just say that it was a strangely out of place in the show and felt more than just a bit contrived. Luckily it was saved by a welcome dash of humour and the falling zombies. So thank you for reading. Please do comment in the box below, I would love to know your thoughts on this week’s episode! It was a nice episode, solely because we have hardly gotten a chance to see Carol and Daryl share the screen for as long as they did here. That, and the fact that it was pretty exciting, without trying to be too action-packed. Good review. Thanks buddy, yeah it has been too long since we last spent time with Carol and Daryl. You looking forward to the next two episodes? I’m worried this show might lose me. Though there were parts of this episode I liked I found it overall to be quite dull. Since the group split it’s slowed down again, and now that the mission to D.C is over before it could begin I’m thinking we’re back to aimless people wandering around. 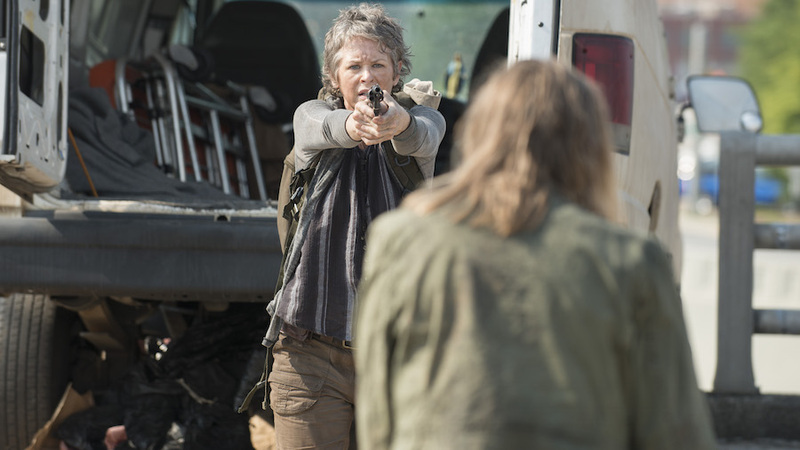 Hopefully the coming Beth/Carol rescue brings back shades of the season premiere. Oh, but a great review! You know what, I think it may just bring back something of the premiere… I am wondering how Rick will react to seeing people in police outfits again. Thinking about it, if some really were cops before the apocalypse, wouldn’t he possibly know them? Yeah it’s good to be back isn’t it! I have really high hopes for the next two episodes before the break. Yeah that group is easily the weakest out of them all. I barely even care about Glenn and Maggie now! I do think that Tara has potential if given time and good writing though.